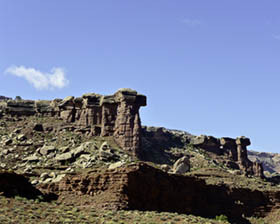 After our visit to Arches National Park, we went across to street to visit the Island in the Sky region of Canyonlands National Park. The two parks are really just across the street from each other. 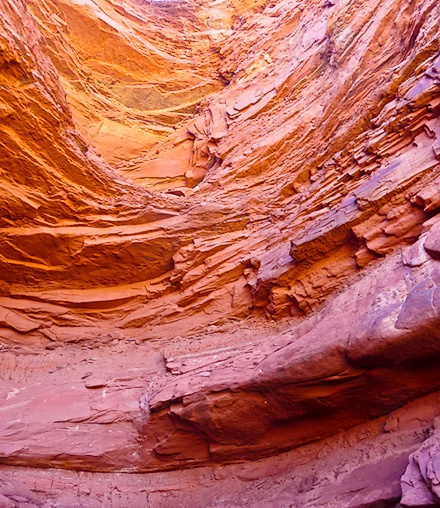 Arches is formed by erosion by wind and flash floods and Canyonlands is formed by erosion by the Green and Colorado Rivers. The contrast is striking. 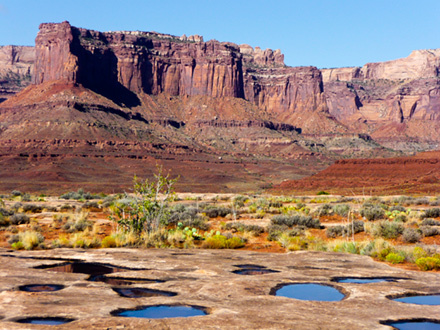 We took a 4x4 excursion followed by a raft trip down the Colorado offered by NAVTEC in Moab Utah to get an introduction to Canyonlands National Park. 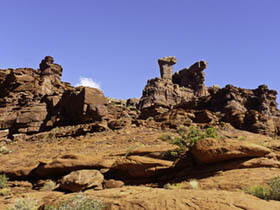 Canyonlands, like Arches, has a large part of the park that can not be explored by normal cars. 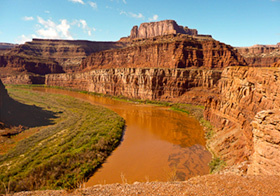 The tours offered by the various companies in Moab provide a good introduction to these parts of both parks. 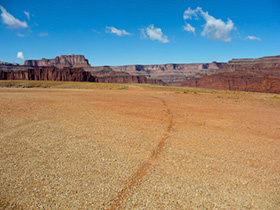 We used Tag-A-Long to see part of Arches and NAVTEC for Canyonlands. The guides furnished by both companies were great. 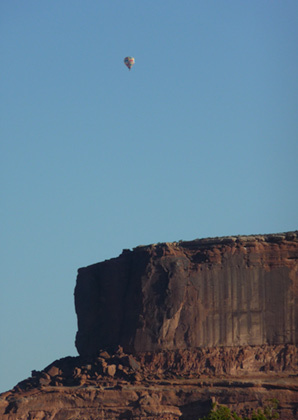 Just as we entered Canyonlands we saw a hot air balloon flying over the park. 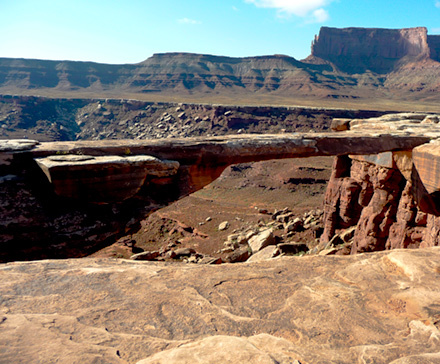 The road in Canyonlands was something else. As you can see from the photo, it was a long way down. Although the road was a 2 way road, it was about wide enough for 1 jeep. And there weren't many wide spots were one jeep could wait for another one to pass. We didn't have to see what happens when two jeeps meet. After quite a bit of driving, we finally got to a place were we could see the Colorado River. 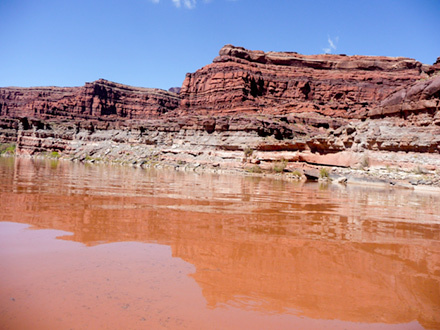 Because of the rain that made Arches so wonderful, the Colorado river lived up to its name--it was a muddy red. As one saying goes the Colorado is too thick to drink and too thin to plow. This was quite a change from the clear water in the river the day before. 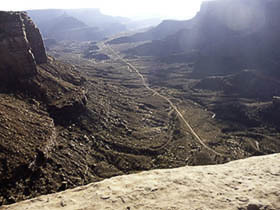 Much of the movie Thelma and Louise was filmed in Canyonlands. 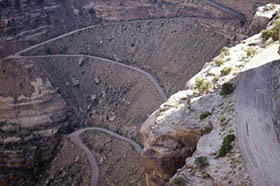 The final scene where Thelma and Louise drive into the canyon was filmed here. 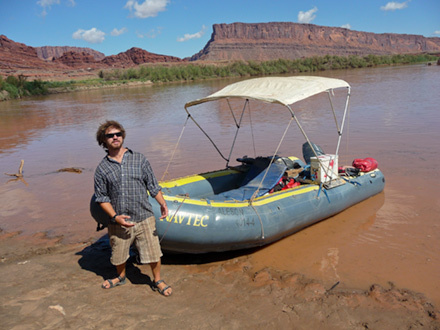 After our tour through Canyonlands, the we were dropped off at the Colorado River for a raft trip down the river through Meander Canyon. 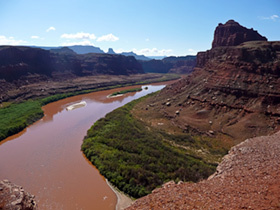 This is a calm stretch of the Colorado River through part of Canyonlands. We were offered to chance to swim off of the raft, but one look at the river convinced us that this was not a good day for swimming. We stopped for lunch at a spot on the river called the Grotto. Really a pretty spot a short walk from the river. After lunch, we headed back up to river. 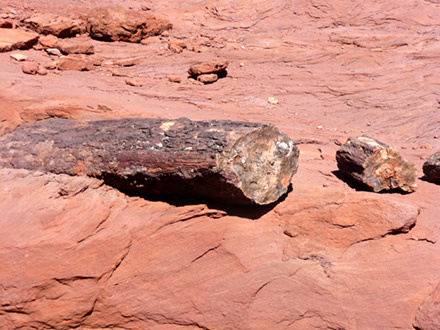 We stopped to see some petrified logs. Some of them were pretty impressive. Must have been quite a forest here a long long time ago. 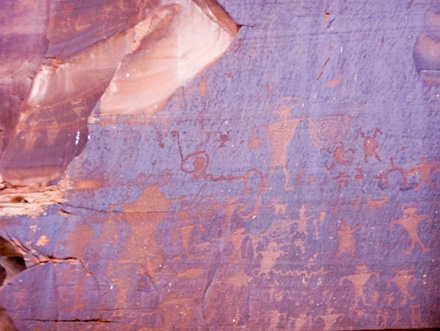 On the drive back to Moab, we stopped to view the most impressive wall of petroglyphs I've seen. The cliff along road was covered with them for a long way. I'd never seen anything like it.